"It is with a heavy heart that we announce the passing of John David Dingell, Jr.," according to the statement. "Congressman Dingell died peacefully today at his home in Dearborn, surrounded by his wife Deborah. He was a lion of the United States Congress and a loving son, father, husband, grandfather, and friend. He will be remembered for his decades of public service to the people of Southeast Michigan, his razor sharp wit, and a lifetime of dedication to improving the lives of all who walk this earth." Debbie Dingell was not present for President Donald Trump's State of the Union address Tuesday evening, prompting her to explain her absence. "Friends and colleagues know me and know I would be in Washington right now unless something was up," Rep. Debbie Dingell, D-Mich., announced on her Facebook page. "I am home with John and we have entered a new phase." "He is my love and we have been a team for nearly 40 years," the congresswoman wrote on Facebook. "I will be taking each day as it comes. We thank people for their friendship and support and ask for prayers and privacy during this difficult time." Dingell succeeded his father, John Dingell Sr., at age 29, taking office on Dec. 13, 1955, and serving 30 terms in the House of Representatives. He retired January 3, 2015, after a storied career inside the Capitol - particularly on the House Energy and Commerce Committee, where he served two stints as chairman. HarperCollins recently published Dingell's memoir, titled: "The Dean: The Best Seat in the House." Speaker of the House Nancy Pelosi, who Dingell swore in as the first woman House Speaker in 2007, called him "a beloved pillar of the Congress and one of the greatest legislators in American history." "John Dingell leaves a towering legacy of unshakable strength, boundless energy and transformative leadership," Pelosi, D-Calif., stated. "His memory will stand as an inspiration to all who worked with him or had the pleasure of knowing him. His leadership will endure in the lives of the millions of American families he touched." "There are few major legislative triumphs since 1955 that he didn't have a key hand in passing," Clinton wrote. "Hillary & I are grateful to have worked with him & called him our friend." "Congressman John Dingell-the Dean of the House and my dear friend-was not merely a witness to history. He was a maker of it," she said in the statement. "I know that all of us in Michigan are sending her and their family and many friends our love and support at this time." In a Twitter thread, Michigan Gov. Gretchen Whitmer remembered him. She wrote, "Today the great State of Michigan said farewell to one of our greatest leaders. 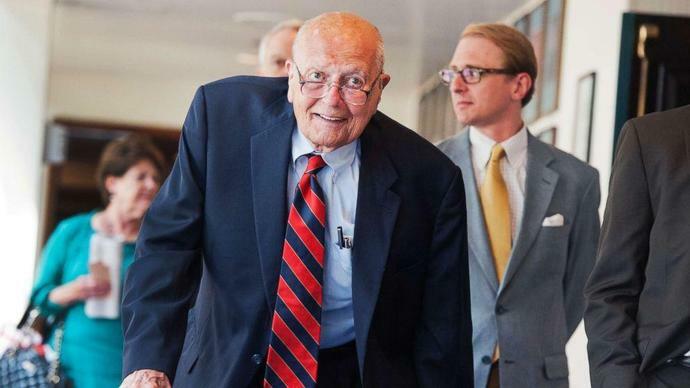 John Dingell will forever be remembered as 'The Dean' of Congress not simply for the length of his service, but for his unparalleled record of legislative accomplishments." "The Congressman's grit, humility and humor taught us all that we can disagree without being disagreeable, while still finding common ground and working together to get things done" she added. WASHINGTON (AP) - The chairman of the House Judiciary Committee issued a subpoena Friday for special counsel Robert Mueller's report as Congress escalates its investigation of President Donald Trump. While saying it's too soon to reach a conclusion, the New York Democrat said at a news conference that there are multiple avenues House committees might take as they pursue their own investigations of Trump and his administration. Nadler, whose panel would oversee an impeachment process, said Mueller's findings outline evidence that the president obstructed justice.